In August 1983 England announced they would be withdrawing from the Home International Championship after the 1984 tournament, bringing to an end 100 years of tradition. But this coincided with the news the annual clash with old rivals Scotland would continue, compounding the anger of Wales and Northern Ireland who understandably felt snubbed. Wales manager Mike England, never afraid to speak up on his country’s behalf, accused Scotland of having performed a “double turn” by continuing to play the country of his surname. “Everyone believes it was England alone who dropped Wales and Northern Ireland, but Scotland have done the dirty on us as well,” he said in December 1983 (as luck would have it that month saw the World Cup qualifying draw pair Wales with Scotland, while England were placed in the same group as Northern Ireland). The final Home International Championship match at Wembley in April 1984 attracted just 24,000 spectators for a 1-0 England win over Northern Ireland, who were to be the last winners of the tournament. The last ever match in the championship the following month produced a 1-1 draw at Hampden Park between Scotland and England, who would be meeting again at the same venue 12 months later. 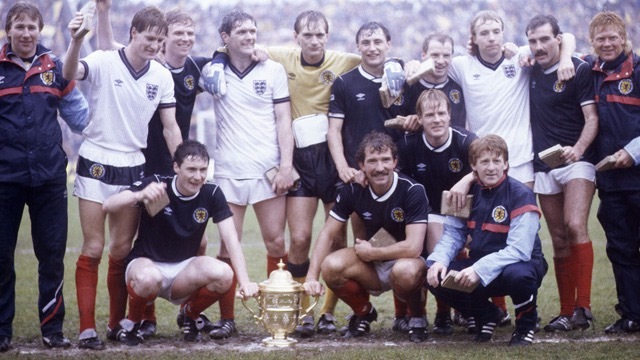 Scotland players celebrate winning the first Rous Cup in 1985 thanks to a goal by Richard Gough (back row, second left). From 1985 the annual clash between England and Scotland would be for the Rous Cup, named in honour of former FIFA president Sir Stanley Rous. But the competition could easily have failed to get off the ground. England were due to be the home side in May 1985, but concerns about the fixture being played on a bank holiday weekend in London put the match in jeopardy. In a shift from the usual pattern, it was agreed Scotland would be at home instead. Although the match was taking place on May 25 – two weeks after the final day of the league season – some players were unavailable due to club commitments. Liverpool were preparing for the ill-fated European Cup final against Juventus, while league champions Everton faced a rearranged game at Coventy City the following day. England had played just three days earlier when they drew with Finland in a World Cup qualifier, while the Scots would also be in qualifying action three days later in Iceland. The match took place during a dreadful month for football, with the tragic events at Bradford, Heysel and Birmingham overshadowing the climax to the campaign. There would have to be an outright winner of the Rous Cup, with a penalty-shoot-out to take place if the score was level after 90 minutes. For the first time since 1976 Scotland beat England on home soil, winning 1-0 thanks to Richard Gough’s header past Peter Shilton. Looking spritely for the age of 90, Sir Stanley braved the wet weather to present the Scots with the trophy – some of them having swapped shirts with their opponents before the presentation. it was the only time Scotland would win the Rous Cup and also sadly the last silverware won by manager Jock Stein, who died suddenly after collapsing near the end of their World Cup qualifier against Wales in September 1985. The fixture retuned to Wembley the following year, taking place on St George’s Day. The match was being played earlier in the year than usual due to the World Cup preparations of both sides. As on Scotland’s last visit in 1983 it was played on a Wednesday night. Alex Ferguson was at the Scottish helm following Stein’s death. Sadly, this was the last Rous Cup tournament Sir Stanley Rous lived to see. He died in July 1986, aged 91. Brazil join the party in 1987 and win the Rous Cup. The competition was giving a fresh look by adding a third side, with Brazil coming to Britain and playing matches against both England and Scotland. Although it was not a truly great Brazilian sides in terms of personnel, their enduring appeal was clear with Wembley packed for the opening game. England took the lead through Gary Lineker in the first half, but with ITV co-commentator Kevin Keegan still talking about the goal Mirandinha equalised (shortly before he moved to Newcastle United). The match ended 1-1, with debutant Stuart Pearce showing he wasn’t afraid to get stuck in when wearing the England shirt. Four days later came a dull 0-0 draw between Scotland and England at Hampden Park, in a match most notable for England unusually fielding two Scottish-based players as Terry Butcher and Chris Woods were now with Rangers. Butcher offered his view the match would have been better if played during the season rather than at the end of it with players looking tired. It certainly hadn’t been one to live long in the memory. For the third meeting in as many years Scotland had a different manager, Andy Roxburgh now being at the Scottish helm. Sadly the football was not the only talking point after the match, with reports of hooliganism and dozens of arrests doing nothing for the fixture’s reputation. It was now impossible for England to be outright winners of the competition, as the Scots enjoyed welcoming Brazil to Hampden Park. Rai and Valdo scored for Brazil in their 2-0 win to give them the Rous Cup, many of the players wearing Scotland shirts while posing with the trophy. Their visit had helped the competition. Gary Lineker takes on Alex McLeish as England play Scotland in the 1988 Rous Cup. After the success of Brazil’s visit in 1987 it would prove problematic finding another guest side to play in the Rous Cup. Over the next two years there would be talk of leading football nations including Argentina, France, Spain and Uruguay taking part but for one reason or another they would not do so. In 1988 it was to be Colombia who came along, a side who had not qualified for the World Cup since 1962 so were a bit of a mystery to many in Britain. Despite low attendances for their matches, Colombia’s selection would be justified as they played entertaining football and it gave the British public a glimpse of players such as Carlos Valderrama and Rene Higuita. The first match of the competition saw Scotland and Colombia draw 0-0, before the Scots ventured to Wembley. A well-taken goal by Peter Beardsley gave England a deserved victory, a week after he had seen a similar effort at the same end ruled out in the FA Cup final for Liverpool. Three days later there was a crowd of just 25,756 at Wembley for the visit of Colombia. The stay-always missed a treat as Colombia’s approach won plenty of admirers and both sides went in search of the win. 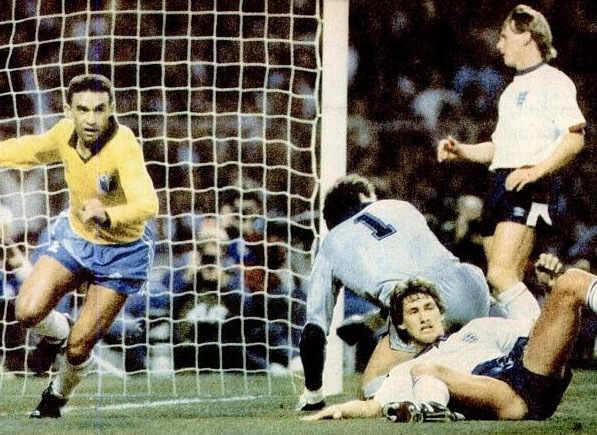 Gary Lineker put England ahead, before the late Andrés Escobar equalised after the break as the Colombians savoured scoring at Wembley. It finished 1-1 to give England the Rous Cup, with traditionalist Bobby Robson telling some of his players off for attempting to swap shirts before the trophy presentation. “I don’t like England players to swap England shirts on the pitch and I don’t like England players going up the rostrum to collect a medal in a foreign shirt,” he told the BBC’s Tony Gubba. Steve Bull marks his England debut in style in 1989, scoring what turns out to be his nation’s last goal in the Rous Cup. If Colombia’s visit had not particularly excited the British public, then the presence of Chile as the ‘third’ side in 1989 proved a total turn-off. At the time they lacked the glamour of Brazil and style of Colombia and their limited appeal was illustrated by abysmal crowds for their appearances at Wembley and Hampden Park (plus at Windsor Park for a friendly against Northern Ireland). The Hillsborough Disaster had prolonged the English league season, with several players unavailable as Arsenal and Liverpool went in search of the First Division title. Nigel Clough and John Fashanu were handed their England debuts in attack for the tournament opener against Chile, while Paul Gascoigne started a full international for the first time. Not helped by a public transport strike, there was a record low crowd of 15,628 for an England international at Wembley. Chile have continually proved difficult for England to beat over the years and that was to be the case here, as they held out for a 0-0 draw. But their negative approach led to reports England players had refused to shake hands with them at the end. “All I know is that Chile did everything they could to stop us,” said a diplomatic Bobby Robson afterwards. Fashanu would only be capped once more and that was away to Scotland four days later. The dramatic title decider between Liverpool and Arsenal the previous night was dominating football conversations (along with the sad news of Don Revie’s death) and this clash felt a bit low-key by comparison. It was a match notable for three things. Firstly, Steve Bull came off the bench to seal a 2-0 win by scoring on his England debut while still technically a Third Division player with Wolverhampton Wanderers. Secondly, England’s Peter Shilton had to wear a Scotland goalkeeper’s shirt. And thirdly, it brought an end to the annual meetings between the sides. Although the authorities had attempted to prevent trouble by limiting ticket availability for England fans, TV news reports showed there was violence on the streets of Glasgow. This disorder was to be the final straw. Three days later the Rous Cup was given an anti-climatic finale, as just over 9,000 were dotted around Hampden Park to see Scotland face Chile. Those that showed up saw Scotland win 2-0 and what turned out to be the final act for the Rous Cup, Murdoch MacLeod scoring the last ever goal in the competition. The result confirmed England as Rous Cup winners for the third time in five years. In 1990 the Rous Cup did not take place as it went the same way as the Home Internationals. Newspaper speculation about England and Scotland potentially meeting later in the year and at a venue other than Wembley came to nothing. And the trend continued in the ensuing years, with each climax to the season passing without the traditional fixture. 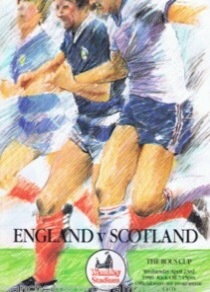 In May 1991 the three-team format was revived as England hosted Argentina and the USSR with a cup at stake, but tellingly it was for the one-off England Challenge Cup with the Rous Cup seemingly reserved for if Scotland were involved. Fans would have to wait until the group stage of Euro ’96 and then the Euro 2000 play-offs to see the old rivals clash again. By then the Rous Cup was but a distant memory, never to return.